Tens of thousands of checks were carried out at airports and border crossing points across 81 countries. Auction houses, museums and private houses were also searched, resulting in more than 300 investigations being opened and 101 people arrested. This resulted in the seizure more than 7,000 objects, nearly 20 per cent of the total number of artefacts recovered during the operations. 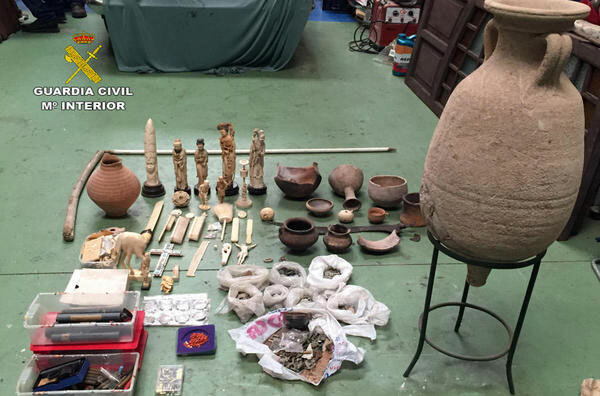 In just one investigation in Spain, the Guardia Civil seized more than 2,000 cultural objects, the majority of which were coins from the Roman and other Empires. Officials also seized 88 pieces of ivory as well as weapons including swords, a crossbow and 39 historical firearms ranging from rifles to pistols. -Argentinean Federal Police recovered the shell of a Glyptodon, an extinct mammal. The shell, estimated to be more than one million years old, was on sale for USD 150,000. -Brazilian Customs seized a marble head hidden in a passenger’s suitcase. Verification of the piece’s provenance is ongoing. -A painting by Nicolas de Staël worth approximately EUR 500,000 was intercepted by French Customs at the Gare du Nord in Paris as it was being smuggled to London. -Searches of a businessman’s two homes and two commercial properties by Greek Police resulted in the recovery of 41 archaeological objects which did not have the necessary license. “The results of the Operations Athena and Pandora II speak for themselves: cooperation between Customs and Police can yield excellent results and should be promoted and sustained at all levels. The fight against illicit trafficking of cultural objects has been long neglected by law enforcement agencies, however, we cannot turn a blind eye to it,” said WCO Secretary General Kunio Mikuriya. While we lose our common history and identity, the proceeds of trafficking fuel terrorism, conflicts and other criminal activities. We will keep working in this area of enforcement and will soon deploy the first specialized global training curriculum for Customs administrations – a very concrete and hands-on outcome of our common work,” he added.